Please note: The school no longer receives uniform orders or enquiries relating to uniform orders. School tie, white blouse, grey skirt/ pinafore dress /trousers, emerald green cardigan or jumper, sturdy black shoes, green/grey tights or grey/white socks. School tie, white shirt, grey trousers or shorts, emerald green jumper, sturdy black shoes, grey socks. Green striped/check summer dress (second-hand only, available from Uniform Shop), black or white sandals, white socks. White shirt with tie or white Hurst Park emblem polo shirt. Plain polo shirts are not acceptable. Black sandals may be worn. Green jogging trousers, green sweatshirt, green shorts, white t-shirt with school logo, change of socks, trainers – not plimsolls. 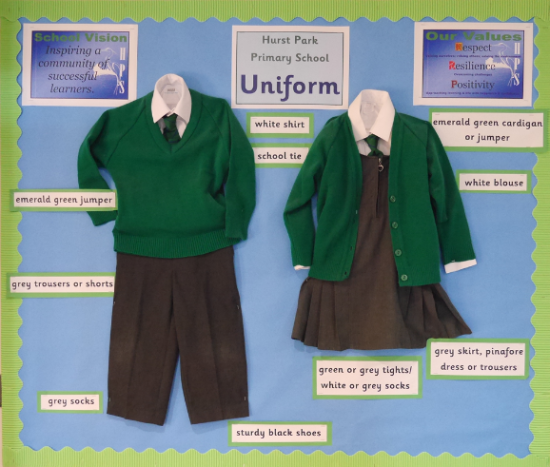 Used uniform donations are gratefully received at all times; please use the special ‘recycling bin’ located in the cycle store opposite the drop off zone.